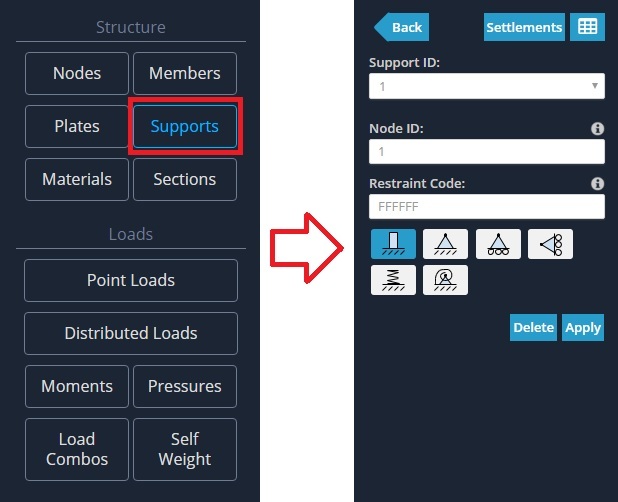 Supports need to be added in order to restrain the structure. If no supports were present then the stucture would not be static and be unsolveable. It is important to remember that a structure must be restrained in every direction at some point by any of the supports. i.e. every degree of freedom must be accounted for by at least one 'F' in the structure. "S" - Spring - The force is being transferred with some stiffness factor. This will require an additional input. A pin support (which only allows rotation about the z axis) would be denoted by the code 'FFFFFR' whereas a roller (which allows rotation about the z axis and movement in the x direction) would be given the code 'RFFFFR'. Fixed Support - 'FFFFFF' - Fixed in all translations (x,y,z) and rotations (Mx, My, Mz). Pinned (Hinge) Support - 'FFFFFR' - Fixed in all translations (x,y,z) and but free to rotate about the z-axis (in this 2D case). Roller Support (in x) - 'RFFFFR' - Free to 'roll' along the x axis and rotate about the z-axis. Roller Support (in y) - 'FRFFFR' - Free to 'roll' along the y axis and rotate about the z-axis. Spring Support (in y) - 'FSFFFR' - There is a spring support allowing some force to be transferred in the y translation.